Minutes ago the news was broken by the Miss Grand International organization that effective immediately I will be stepping into the role of Miss Grand International 2015. Unfortunately due to personal reasons Anea made the decision not to continue, a very difficult decision to make and one I am sure has come with a lot of sacrifice and sadness so I hope you will all continue to support her. I wish her all the very best in her future and I will always have fondness in my heart for her. Keep shining beautiful girl! As for me, I am utterly shocked and thrilled to have had this opportunity presented to me, as a first runner up in any pageant it is your duty to support the winner and step in if she is no longer able to fulfill her responsibilities, however it is incredibly rare for such a situation to occur and I am so grateful that it is written in the stars for me. Thank you so much to the MGI organization and all involved for this once in a lifetime chance, during the next 6 months of my reign I promise to uphold all the ideals of the organization and all the expectations of a queen and will work hard to advocate our message to 'stop the war and violence'. I am so excited for the doors this opportunity will open and the amazing people I will be able to work with along the way and can't wait to see what this journey brings me. To all my friends, family and fans, in Thailand, in Australia and all over the world; thank you guys for your unending support and love, it means so much to me and I'm so happy to be able to share this with all of us! 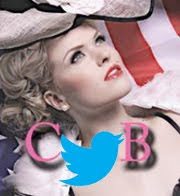 The messages of congratulations have been flooding in and I will do my best to get back to each and every one of them! But know that they are appreciated from the bottom of my heart. Less than 12 hours ago my whole world was turned on it's head, you can never expect the amazing things life will bring to you and I'm so blessed and thankful for these incredible, unexpected gifts every single day. I am truly honoured and humbled. I will be seeing you very soon Thailand! “Although we believe Anea was the deserving winner at MGI coronation event, she has failed to fulfill her obligations as the reigning queen. First, her studies were in the way, making it very hard for us to schedule her activities. At several times we had to reschedule, cancel events, change or lose international flights. Miss Grand International should be ready and focused on her job and charitable work. Her actions were disrespectful to the organisation and Mr Nawat does not appreciate this kind of attitude, which brought us to make this decision. 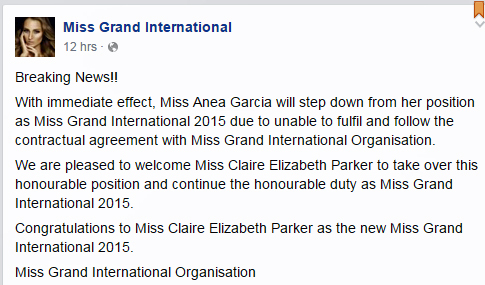 Claire Elizabeth Parker is very happy and ready to take over the duties as Miss Grand International 2015. 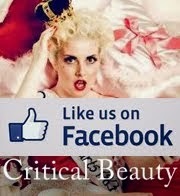 She will move to Thailand shortly and we will hold a press conference on April 1st for her official crowning. We expect Claire to vist at least 7 or 8 countries as Miss Grand International and we are sure that she will suit the title properly and do an excellent job. 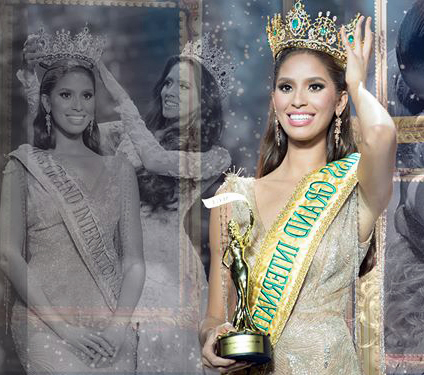 We take this opportunity to inform that soon we will also announce the host country for Miss Grand International 2016. Anea Garcia's resignation has amplified the pageant's shaky and troubled reputation since its inception in 2013. The owner of the pageant, Nawat Itsaragrisil, is known to rule with an iron fist and has burned bridges with the media and pageant fans. The pageant's campaign, "Stop The War and Violence," seems unrealistic and frivolous. And the first three titleholders including Anea are of Hispanic descent and all carry an American passport, which makes one wonder if the organizer has a soft spot for American-raised Hispanic/Latina beauties. Rumor has it that Anea wants to compete in the 2016 Miss Dominican Republic pageant set for April 24, and if she wins, she gets to compete in the next edition of Miss Universe. 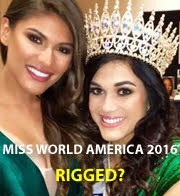 But even if the rumor were true, why would the judges crown a young woman who failed to fulfill her reign as Miss Grand International? I am sure the Miss Universe Organization has already picked up her story and has placed her name in a folder for "Undesirable Girls". As for Chaivisut's statement, it reeks of impropriety and tackiness. There is no need to shame Anea and to go into details of her "prima donna" attitude. When Oxana Fedorova was stripped of her Miss Universe crown in 2002, MUO did not make an elaborate, pernicious statement about her character; they simply declared that she was unable to fulfill her duties because they were interfering with her academic pursuit. For any unflattering details there might have been about Oxana, they were subtly kept under wraps. Because of Chaivisut's harsh judgment of Anea's character, Anea will now be remembered forever as the girl who demeaned, degraded, and humiliated the Miss Grand International organization.